Whether you are celebrating a holiday like Thanksgiving or Christmas, or you’re just feeling fancy, prime rib makes an amazing meal. Don’t let any of it go to waste by making this leftover prime rib sandwich recipe. It doesn’t feel heavy after a fancy meal and will satisfy everyone. 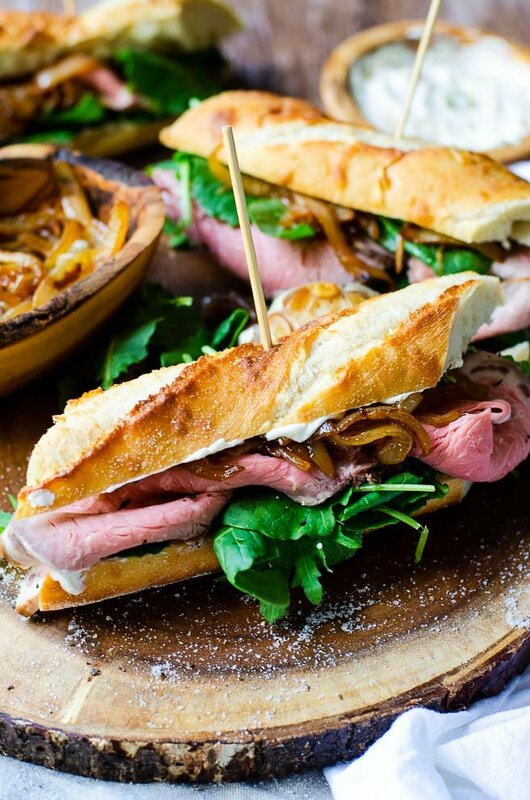 Prime rib sandwiches are a great way to enjoy leftovers. They’re quick to assemble, but flavorful and satisfying. Make them more gourmet with a slightly tangy horseradish sauce that will make you completely okay with not having au jus. How Long Are Prime Rib Leftovers Good For? Prime rib leftovers are best eaten within two to three days of cooking. However, with a good airtight container, they will stay fresh in the refrigerator for up to five days. The more well done your prime rib is when you refrigerate it, the longer it will last. If you roast your prime rib to the typical rare to medium rare, potential bacteria has a better chance of growth. It’s one of those situations of being better safe than sorry. Make this prime rib sandwich recipe sooner than later. Since a prime rib roast is such a pricey cut of beef, you want all of the leftovers to be relished. One of my favorite ways is a prime rib sandwich. If I feel lazy, I can eat it cold. If I feel more gourmet, a quick toasting under the broiler makes a crusty hot sandwich. Another reason I love making this prime rib sandwich is that it doesn’t overcook your leftovers. Many leftover prime rib recipes cook it beyond the beautiful rare to medium rare doneness you worked so hard for. This one, however, focuses on retaining it. Even if you choose to make your sandwich hot, the broiler keeps the cook time as brief as possible. Prime rib and horseradish sauce are a classic pairing. This horseradish sauce on this prime rib sandwich however has a slight variation. It is subtly muted by sour cream, while getting a flavorful boost from the roasted garlic. The secret ingredient though is the white balsamic. It’s there to just lightly boost the brightness of the sauce and allow the flavors to shine through. (Like lemon juice with berries.) If you really want to go above and beyond, these culinary skills and techniques will take your prime rib sandwich to a new level. How To Make Roasted Garlic. This goes through the details of how to make roasted garlic perfectly. If you overcook it, it is hard to remove from the head. If you undercook it, it doesn’t bring enough flavor to the horseradish sauce. Make sure you get it right. Make Perfect Caramelized Onions. Perfectly done caramelized onions leave nothing behind in the pan and have no scorch marks. Find out how to control your cooking so that your caramelized onions have excellent flavor AND texture. 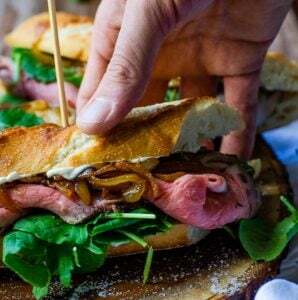 If you know you are going to make this prime rib sandwich recipe, I recommend making your roasted garlic and caramelized onions ahead. That way you don’t spend multiple days hanging out in your kitchen. If you want to make this prime rib sandwich hot, I recommend using your broiler on a medium or low setting. (If your broiler has settings.) Assemble the sandwiches without the baby kale and place them on a baking sheet. Cook them in the middle of the oven for two to three minutes, or until heated through. After you’ve removed them from the oven, carefully open the sandwich and add the greens. The residual heat from the sandwich will warm them up for you. Want a free printable grocery list for this leftover prime rib sandwich recipe? Get it HERE. Use your prime rib leftovers to make the ultimate sandwich. With a rich and tangy horseradish sauce, and sweet caramelized onions, you won't want to stop eating it. Preheat the oven to 425°F. Cut the top off of the garlic heads and drizzle them lightly with olive oil. Place them on some aluminum foil and fold the foil into a packet. Roast for 45 minutes, or until the cloves are caramelized and starting to come out of the head. Open the foil packet and let the garlic cool to room temperature. Remove the cloves from the head. In a large skillet over medium heat, melt the butter and add the onions. Reduce the heat to low and cook until the onions are golden brown, stirring occasionally. When done correctly, this should take about 30 minutes. Let cool to room temperature. In a blender or food processor, add the sour cream, balsamic, roasted garlic cloves and horseradish cream. Pulse until the roasted garlic is incorporated. Stir in the fresh thyme and season with salt and pepper, adding any extra horseradish cream to your preference. Set aside. Remove the ends from the baguette and cut it into four equal pieces; about four inches long. Carefully slice horizontally into the bread (but not all the way through) to open it up. Slather the inside of the baguette with the horseradish sauce. Place a layer of baby kale, followed by 4-6 thin slices of prime rib. Dollop caramelized onions on top and add some fresh cracked black pepper. Close the baguette around the sandwich and serve. You can save yourself time by making the caramelized onions while the garlic roasts. They both should finish around the same time. I would make sure to cook a large piece of meat just to make sure I have leftovers for this sandwich. OMG this is a sandwich worthy of being dinner during the week. That horseradish sauce sounds like the perfect topping. I can’t wait to give this a try. I always feel bad using prime rib leftovers in a lackluster way, so this sandwich always feels fancy enough to match the meat. I hope you love it! That horseradish sauce sounds out of this WORLD. I love any opportunity to use horseradish and often eat beefy things specifically as a vessel for horseradish. But this sandwich looks so good, I think I might have to make some prime rib specifically for this recipe—not as a way to use leftovers. I’m drooling! I totally serve this same sauce with my prime rib on Christmas as well. They pair together so well, why not! After seeing this sandwich, I think I’ll have to buy a slightly larger Prime Rib just for the express purpose of HAVING leftovers. The horseradish sauce sounds like it would give a nice heat and tingle, but the piece de resistance for me (aside from that glorious french bread — who is your baker???) are the caramelized onions and roasted garlic. I make caramelized onions in big batches and freeze them in individual containers — for just such a food emergency… You’ve put a lot of thought into this post and it clearly shows. Yes! The caramelized onions and roasted garlic bring such a nice balance to the horseradish. Also, I keep backup emergency caramelized onions as well! They’re so good! 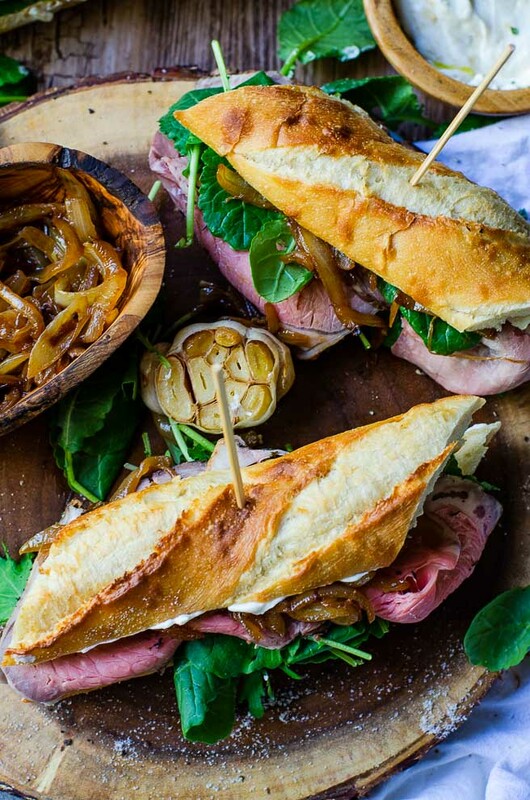 Those caramelized onions on the sandwich look ah-mazing! I’d love some on my leftover rib sandwich! We almost always have leftover prime ribs whenever we make one so this is just perfect. That homemade horseradish sounds perfect too! The homemade horseradish sauce is totally what makes it. The sweetness of the caramelized onions and roasted garlic is a superb combination. This sandwich is amazing! I just pinned it so I can make this for my hubby! He will love it! I hope he does, Amy! It’s such a great way to use up those prime rib leftovers! This sounds like the perfect way to use up leftovers! Mmm….prime rib and crispy bread with all the flavors! Love this idea, now I just need to make some prime rib! I’m all about the crispy bread with leftovers. There is something about a good crusty baguette that makes this leftover prime rib sandwich so good! I wish I had more excuses to make prime rib! Thanks for the info on how long the prime rib will last. I’m never quite sure. But this sandwich, wow. Talk about a way to make it a tough call which is better – the original meal for the leftover sandwich!! I get so nervous about things like how long prime rib is good for, too. Especially when I cook it rare. Guidelines make it so much easier to gauge and make appropriate choices. The roasted garlic and caramelized onions help provide a sweetness that balances the tangy horseradish sauce so nicely. It makes it taste super gourmet without adding anything too fancy. This prime rib sandwich looks absolutely delicious! And my husband would love that horseradish sauce. I was a bit worried about all the work involved in roasting the garlic and caramelizing the onion, but if you make those two components ahead of time as you suggest, assembling this sandwich should be a breeze. Great recipe! Yes! The last thing you want to do is slave away in the kitchen after a big day of slaving away. Making them ahead is such a simple task, but really makes this prime rib sandwich amazing! I would totally eat a prime rib sandwich for breakfast! Why have I never thought of that before?!?! Perfect caramelized onions make everything taste better! YUM. Thanks for the link on that. I totally appreciate this post. We will definitely have some prime rib left over and this will definitely make the troops happy. It’s a very elevated sandwich over what I would slop together the following day. They will love this. I absolutely agree about the caramelized onions! I hope they all love it! Now that is what I call a sandwich! That is something you’d find at a fine restaurant. We love our prime rib but with all the males in the family we don’t have leftovers. What we can doo is follow the recipe and when we have a part of a beef roast leftover we’ll cut it paper thin. And with beef, horseradish is a must!! I definitely can relate to not having many leftovers. Every year it seems like I buy a larger and larger prime rib in hopes of leftovers, but rarely get enough! I love a good prime rib dinner, but I have to admit, the sandwiches the next day are often my favorite part of a big meal! 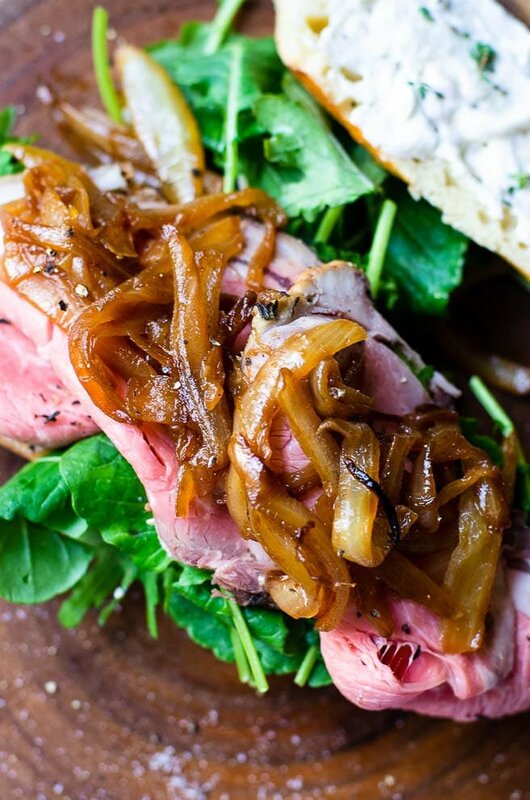 Your prime rib sandwiches are gorgeous and I love the addition of caramelized onions. Thanks for the tip about broiling to make a warm sandwich without overcooking the meat (which we all work so hard to make sure is precisely the right doneness the day before!). I always get frustrated when I watch the perfectly rare meat get cooked beyond my desires in an effort to reheat. The broiler is such a commonly forgotten about part of of our kitchen, but so handy. Your pictures are really nice! I love the lighting in them. AND, your recipe sounds amazing!! I love finding new ways to use leftover prime rib. Thank you so much for the new recipe idea! You are so sweet, Sam. Thank you. I hope you get to try the recipe and love it!